In the USA, the FDA has approved GM salmon for use as food: the first time a GM animal has been allowed into the food chain. The GM salmon eggs will be produced by the company AquaBounty in Canada, shopped to Panama for growing in an on-land facility, and then shipped as dead fish products to the US market, where they are not required to be labelled as GM. Environmentalists are concerned about the impacts on wild salmon if the GM fish escape, including if GM fish eggs are accidentally or deliberately diverted to fish farms elsewhere in the world. The Center for Food Safety has stated it will bring a legal case against the decision. The reproductive biology of fish is much simpler than that of mammals, so they are easier to genetically modify. Scientists have genetically modified about 35 different species of fish in the laboratory. A genetically modified (GM) fluorescent zebra fish is being marketed as a pet in the USA, but currently there is no commercial production of GM fish as food. However, the company AquaBounty has received approval from the US Food and Drug Administration (FDA) to market GM Atlantic salmon in the US. The company proposes to ship GM fish eggs from its Canadian facility to Panama, for production in an on-land facility. The fish would then be trucked to the US for sale, as well as sold in Panama. In future, it plans to also sell eggs for production elsewhere. The GM salmon includes a growth hormone gene from Chinook salmon (native to the North Pacific) and an anti-freeze protein gene from the ocean pout (native to the North West Atlantic). As a result, the transgenic fish produces growth hormone all year (rather than just during the warmer months) and reaches maturity faster than non-GM salmon. There are concerns about the impact of GM salmon on wild salmon should it escape into rivers or the Atlantic ocean, because it could out-compete wild salmon for food, or breed with them producing offspring that may be less fit to survive. This could have serious negative effects on declining or endangered wild salmon populations. Although the eggs AquaBounty plans to produce will be all female and treated to produce sterile adult fish, this process is only up to 95-99% effective. Reports the view of Ron Stotish, AquaBounty's CEO. Reports high-tech non-GM approaches to fish breeding. GM carp, intended to be used as a biological control measure to crash the population of wild carp, loses funding in Australia. Reports that an email that surfaced during the hearings revealed AquaBounty's Prince Edward Island facility in eastern Canada may have tested positive for Infectious Salmon Anemia virus, or ISAv in 2009. AquaBounty is the maker of AquAdvantage genetically engineered salmon. Includes links to all FDA documents, including the consultation on the draft environmental assessment. Includes links to public documents. 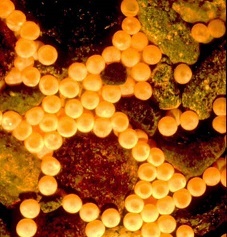 Reports that during the 2014/15, Aquabounty expanded its international commercial efforts with the commencement of the process to gain approval for the importation of its GM salmon eggs for local field trials in Argentina, Brazil, South Africa and China (in addition to its current site in Panama). Approval for commercial production of AquaBounty's GM salmon eggs on Prince Edward Island. Legislators in Alaska warn the FDA that "There is a very real fear that genetically modified salmon could wreak havoc on populations of wild salmon". They are also concerned about potential negative effects on the Alaskan economy, potential risks to public health and lack of rigorous scientific scrutiny. Includes sections on GM fish. NASCO states: "In view of the current lack of scientific knowledge on the impact of transgenic salmonids on wild salmon stocks, the use of transgenic salmonids should be considered a high-risk activity. There should be a strong presumption against any such use".